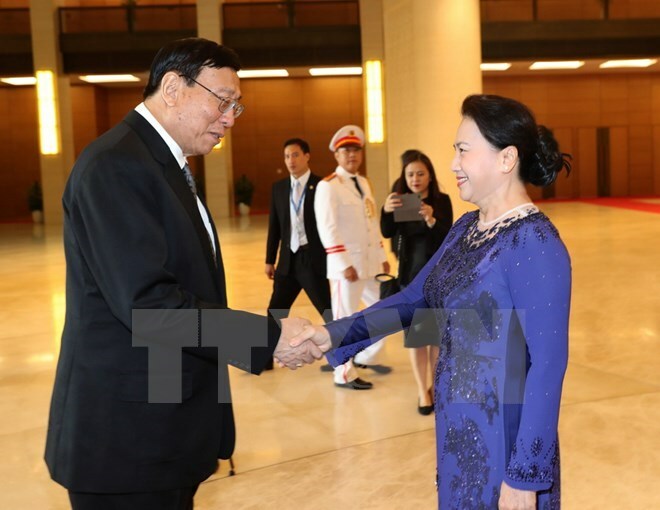 Hanoi (VNA) – President of the National Legislative Assembly (NLA) of Thailand Pornpetch Wichitcholchai left Hanoi on August 16, concluding his four-day official visit to Vietnam at the invitation of National Assembly Chairwoman Nguyen Thi Kim Ngan. During his stay in Vietnam, President Wichitcholchai held talks with NA Chairwoman Ngan, paid a courtesy visit to Prime Minister Nguyen Xuan Phuc and met with the Vietnam-Thailand Parliamentary Friendship Group. At these meetings, the two sides expressed their delight at the development of Vietnam-Thailand relations in recent years with the regular exchange of high-ranking delegations. The two sides agreed that functional agencies of the two legislatures will closely supervise the implementation of the cooperation agreements signed between the two governments and maintain the exchange of delegations at all levels while the two parliamentary friendship groups will also strengthen their cooperative ties. They held that parliamentarians of Vietnam and Thailand should share viewpoints and support each other at international and regional inter-parliamentary forums in issues of mutual concern, thereby contributing to the building of a peaceful, stable and developed Asia-Pacific region. The leaders agreed to create better conditions for businesses from the two nations to meet in order to boost bilateral trade and investment relations. Thailand hoped that more Vietnamese investors would do business in the country, adding that the two legislative agencies are ready to work together to resolve obstacles facing investors.